The North China Daily News Building (simplified Chinese: 字林大楼; traditional Chinese: 字林大樓; pinyin: Zìlín Dàlóu) is a historical Neo-Renaissance-style office building on The Bund in Shanghai, China located at No.17, The Bund. 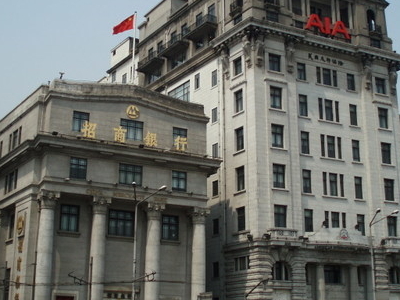 It currently houses the offices of the American International Assurance (AIA), and is thus often called the AIA Building (友邦大廈; Yǒubāng Dàshà). At the time of its opening in 1924, it was the tallest building in Shanghai. The North China Daily News was the first English-language newspaper to be published in Shanghai, in 1850. Because the newspaper's founder saw Shanghai as a growing commercial center and founded the paper to support Shanghai's growth, much of its original content was related to shipping news. The paper expanded as Shanghai grew, and moved to the Bund in 1901. In 1921 the paper began construction of this building as its new headquarters, and completed construction in 1924. The building was designed by architects Lester, Johnson & Morriss (zh), which was co-founded by Gordon Morriss, the brother of the newspaper's owner at the time, Henry E. Morriss. From 1927 the building also housed the offices of American Asiatic Underwriters, an insurance agency founded by Cornelius Vander Starr and the forerunner of the American International Group (AIG). The Japanese Empire confiscated the building during its occupation of Shanghai during the World War II. During that time the building was home to the Tairiku Shimpō (大陸新報), a Japanese newspaper. The North China Daily News Building is a reinforced concrete structure with Baroque towers, Neoclassical pillars, and Renaissance relief sculpture. The first seven floors are faced with granite, the lowest two floors of which are rough hewn. The building originally incorporated the statues two goddesses, which flanked the marble entrance, but these statues were destroyed during the Cultural Revolution. The building contains 9,043 square metres (97,340 sq ft) of office space and lies on a 1,043 square metres (11,230 sq ft) plot of land. Here's the our members favorite photos of "Key Buildings in Shanghai". Upload your photo of North China Daily News Building!